Sub-Zero - Rated Top Green Brand - SubZero Parts- CLICK HERE! We recently featured an article that talked quite a bit about the Energy Star ratings of specific appliance brands and this is a continuation of that article. Two brands GE and Subzero should be given a pat on the back for thier additional efforts in helping our planet stay green. Sub-Zero was ranked on the Top 10 list of Green Brands in 2007 by the ImagePower Green Brands Survey. In this independent, 3rd party research, more than 3000 consumers in the United States and the United Kingdom were polled to rate the most ‘green’ brands. I read a little bit about SubZero's effort on the corporate website. It seems that for Sub-Zero, green is more than just an Energy Star rating. Even the largest refrigeration product they manufacture, the Sub-Zero PRO 48, uses less energy per month than a 100-watt light bulb according to the website. From being built in the USA, to supporting organic farmers and food artisans, to using renewable energy, to extensive recycling, to sourcing environmentally friendly materials and supplies, to providing living wages to factory workers - Sub-Zero & Wolf have been ‘green’ long before the term even existed. Subzero featured product: Practically an in-home ice factory, the Sub-Zero 315I Ice Maker holds 26 pounds of ice cubes and can crank out up to 30 pounds of ice a day. The unit is compact, slightly over 15" wide. More on Energy Star Ratings next time! Memorial Day Weekend Appliance Fix Em' Jobs- CLICK HERE! I don't know of any family that is staying home for the weekend that doesn't have a list of tasks to do around the house. Maybe your dishwasher racks have the little knobby things missing from the ends .. or your refrigerator needs a new light bulb - there is always something that needs to be done. Order you appliance parts online and save! Whether you are ordering your parts online or taking a run to the local Sears Stores (check here first for Sears Coupons) you will need a few things before going. The Appliance model number is the key reference to the home appliance you have. The appliance's serial number may identify the age of the product but is not necessarily needed if you are looking for appliance replacement parts (although there are some exceptions to this rule). Whenever inquiring about your dishwasher, refrigerator, microwave or other appliance, you should have at least the brand name and the model and serial numbers of the appliance. I know that Repair Clinic will honor manufacturer warranties, and there may be other stores that do also .. but be sure to check our handy Appliance Part Warranty Chart. Have a wonderful Memorial Day Weekend .. take a break here and there for all of your tasks! Energy Star Washing Machines and Energy Star Diswashers- CLICK HERE! ENERGY STAR is a government-backed program helping businesses and individuals protect the environment through superior energy efficiency. Here is the official energy star website. Most washing machines use 40 or more gallons per load. This is an huge number. Not only is it wasteful, but it can get very expensive when you consider how many of these gallons need to be heated and how much energy is needed and paid for to make this work. For washing machine replacement parts -click here. 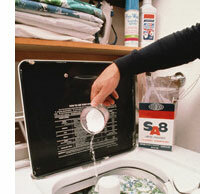 Energy Star rated washing machines use between 18-25 gallons. These appliances will save you 38-55% on water consumption per load, and depending on how many loads you wash on Hot. It will also reduce the heating bill by nearly half per load. Water usage is a culprit of high cost in home energy bills. Depending on how many showers people take, and how many people there are in the home to take them as mentioned above, sprinklers, pools and fish tanks, water can become a huge spender, especially when you have to heat it. Simple actions can make a big difference. If just one in 10 homes in the United States used ENERGY STAR qualified appliances, the change would be like planting 1.7 million new acres of trees. The Jenn-Air® brand "Invitation to Inspiration" escalating cash back event offers consumers who purchase select Jenn-Air brand appliances between February 10, 2008 and July 12, 2008 an opportunity to receive up to $1,000 cash back by mail. Jenn-Air Appliance Parts here. Consumers will receive a bonus $250 cash back by mail when the package purchase includes a select Jenn-Air built-in-refrigerator. Check all Jenn-Air Rebates here. stainless steel kitchen appliance packages up to $300 cash back by mail. Amana Coupons are here. qualified dishwasher. Amana Appliance Parts and Accessories are here. qualified models. Find more Amana Rebates here. Save Money, Time and the Environment! Universal or Adaptable Appliance Replacement Parts- CLICK HERE! Aftermarket or generic universal appliance replacement parts may be made by the same exact company that supplies the original appliance parts to the appliance manufacturer or they might be manufactured by a company not affiliated with the appliance manufacturer in any way. Think about shopping at a grocery store that offers their own "generic" grocery brands. These brands are really made by the companies that make the national brands but are packaged for the grocery store. This is the same way that the appliance parts vertical works. Switches, controls, motors, belts and appliance hinges may be parts that are manufactured universally. In most cases these types of appliance parts will be the exact (or very close) fit as the original but their specifications may vary slightly from the OEM. There are also OEM appliance replacement kits which may work for other multiple appliance brands. An example appliance part is the universal electric range and cooktop surface element infinite heat switch controls. In this case the part manufacturer (Robertshaw) supplies the same appliance part to the various appliance manufacturers whom each then just label it with their own appliance part number. It can be riskier to order a universal appliance part - so be sure that you are purchasing from an Appliance Parts Retailer that offers an excellent return policy. Spring Clean your Range- CLICK HERE! It's time to get your range ready for summer. Replace your old surface and bake units and dull drip pans with shiny new parts if you can't get the old ones clean! First, let's talk about keeping your range clean to begin with. Cleaning after each use of the cooktop with cleaning cream will keep the cooktop looking new and easy to clean. Ceramic cooktop cleaning creams are the best. Cooktop Cleaning Cream, gently cleans glass ceramic, stainless steel or glass cooktops. If your appliances are stainless steel - pick up a stainless steel cleaner, also. Stainless Steel Magic - Gently polishes and removes water spots, grease and stains from all your stainless steel sinks and appliances for a gleaming finish. Keep that old stove of yours looking and working like new! Also popular for cleaning and prepping is CERAMA BRYTE Ceramic Cooktop Cleaner. It is designed for use on ALL glass-ceramic cooktops. It is tested and qualified for CERAN® by SCHOTT GLAS and is recommended by EuroKera. It is non-toxic and biodegradable. Turn off all surface units. Remove hot pans. Any remaining spillover should be left until the surface of the cooktop has cooled. Do not use the surface units again until all residue has been completely removed. If your electric surface burners are not heating as normal, lightly sandpaper the contacts on the element and the block they plug into. Safety first, unplug your stove. If service is still impaired, replace blocks first, then the coiled element. Can't get the top burners clean no matter what you do? You may have to replace your top burnersWhen replacing Range top burners, plug in type, always check for burnt contacts in burner receptacle. To be safe replace receptacle with top burner. To find the correct burners - find the model number first. Open oven door wide, model number plate located on mullion between the hinges. Lift the left front surface unit, model number plate is on the inner left side of frame. On the frame behind oven door. Pull lower drawer out. Model number plate is on horizontal or vertical member of frame. Lift right front or rear surface unit. Model number is on inside, right side of frame or the back corner of the frame. 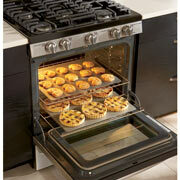 Use the search bar on top of this blog .. or click here to find shiny new oven and range parts! LG Appliance Parts - Model LRG30357 Gas Range Parts- CLICK HERE! Style and Design With LG’s freestanding gas ranges. LG offers style and convenience with One Touch Controls on these gas ranges. The SmoothTouch controls are attractive, easy to use (and easy to replace) and effortless wipe clean. One of the most powerful burners available in a freestanding range. Reliable .. but sometimes things go wrong. The LG 16.5K BTU burner enables you to bring large amounts of water to a rapid boil resulting in faster cooking time and saved energy. This burner can maintain a low 700 BTU setting which is excellent for delicate cooking tasks such as melting butter or chocolate. These seldom need replacement ..but if you need one, you can find it here. This cool window allows you to easily check the progress of a meal in the oven without having to open the door and get hot air blasted at you! Happy Mother's Day from Appliance Life Parts & Repair- CLICK HERE! We wanted to find a poem for Mom that was applicable to the nature of our website. In many households a Mom does everything .. from fixing booboo's to fixing appliances. Unfortunately, the author is unknown on this beautiful poem so we are unable to give credit where credit is due. Come in, but don't expect to find All dishes done, all floors ashine. Observe the crumgs and toys galore. The smudgy prints upon the door. Don't thrive on a spotless atmosphere. And carefree even messy play. Their needs are great, their patience small. All day I'm at their beck and call. It's Mommy come! Mommy see! Wiggly worms and red scraped knee. ainted pictures, blocks piled high. My floors unshined, the days go by. And I at last will have a rest! Celebrate Mother's Day today with a day of relaxation - forget the broken washing machine, and the air conditioner that needs to be turned on for the summer. Tips to Dry Clothes More Efficiently - Dryer Parts- CLICK HERE! Clothes Dryers are a luxury that we cannot live without and when the clothes come out too damp, it can irritate even the best of us. We count on our dryers 52 weeks of the year. Here are some quick tips to extend the life of your clothes dryer and save energy. Avoid kinking the exhaust vent behind dryer. Besides making it harder for the dryer to dry your clothes, you may need a replacement dryer vent quicker. If your dryer is very close to the wall, try a Dryer Vent Periscope. A periscope is designed to allow close placement of the dryer to the wall. Metal clamps on a dryer vent periscope make installation easy with common household tools. The shorter the better (as far as vents go). Exhaust ducting should be of a metalized semi rigid/flexible material. Do not use vinyl as it can be easily smashed. Vinyl will not withstand heat as well as metalized ducting. Check your outside vent hood for clogs and dirts. Make sure that you clean it regularily if necessary. Don't use mesh wire or grates to cover the vent hood unless you are willing to clean the grates out regularily. Grates will definitely help keep rodents or birds out of your exhaust but can easily cause clogging. Lint always makes it through the dryer's lint screen and can clog the grate. The best dryer vent hood has a flapper that opens when the clothes dryer is in use and closes when off. Check the proper operation of the flapper on a regular basis. Do not overload dryer and do not underload the dryer. Too many clothes will inhibit proper circulation of heated air between the garments. On the other hand, too few clothes in the clothes dryer can create a similar problem by bunching and not allowing proper air flow through the clothes. Proper air flow will make for a faster dry time. In winter months, dryers located in a heated area of the home will dry more quickly than in a basement or non-heated utility room. This may not be something you can control, though. Drying loads sequentially will reduce overall dry time by using the heat retained by the dryer from previous loads. So go back to the "laundry day" idea that our Mothers had. Recheck pants pockets and clothes cubby holes before putting clothes into dryer. Gum, pencils, pens, money, nails, earrings, jewelry, etc. can damage clothing as well as damage your appliance. Improperly vented dryers can pose a serious fire hazard. This hazard can be drastically mitigated or even eliminated by installing a fire-safe venting system. Load the Dishwasher Correctly and use Glisten- CLICK HERE! I read a news article today about a new SteamClean Dishwasher by Maytag. The part that caught my eye was that the dishwasher runs approx. 24 minutes longer than a normal dishwasher. I have to wonder how much more energy this takes and is it worth it? This triggered a little bit of research about how to properly load a dishwasher to maximize it's ability to clean your dishes. Careful placement of dishes in the dishwasher, plus an enzyme detergent and rinse aid, can make the difference between glistening dishes and grungy ones that generate caked on residue! We suggest that you skip prerinsing, because it wastes time, energy,and as much as 6,500 gallons of water per year. Keep large dishes and items at the sides and back, so that they don't block water and detergent from reaching other smaller dishes, cups and glasses. Use the top rack for plastic and delicate items that are dishwasher safe. Put silverware handles down, but knife handles up. Be careful when removing the cleaned utensils .. you don't want to get stabbed by a fork! Place items with baked-on food facedown and toward the sprayer in thebottom rack. Environmentally Safe, Glisten gets your dishwasher sparkling clean and lemon fresh. Glisten works hard to remove built-up soap scum, food stains and discoloration due to iron and other water impurities. A clean dishwasher can help get your dishes cleaner. Glisten is a non-toxic, citric acid mixture designed to remove iron and manganese, known as hard water stains. It is also safe for septic systems. Glisten will remove food stains on dishes as well. Glisten can be used in small amounts with dishwasher soap to keep glasses and dishes clean. Regular monthly use of Glisten Dishwasher Cleaner is recommended for best results. Glisten can also be used as a laundry aid to brighten whites. 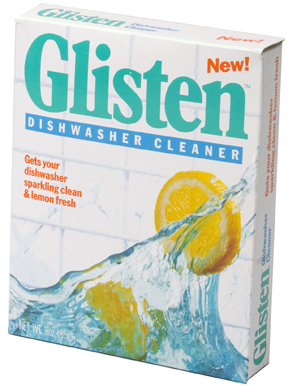 Glisten's Dishwasher Cleaner is not just for cleaning dishwashers, however. It's a multi-purpose cleaning product. It removes stains from dishes, sinks, plastic, and glassware. Use it in the laundry room to remove unsightly iron stains from the tub of the washing machine. Or try it in the bathroom to tackle those tub, sink, or toilet stains! Replacement Icemaker for Maytag and Whirlpool Refrigerators- CLICK HERE! I don't know of a single icemaker that has outlasted it's refrigerator. Have you? The Icemaker always goes first and in most cases -the owner doesn't realize how easy and inexpensive it is to purchase and install a replacement icemaker. This Whirlpool 3417943 Ice Maker uses an electric motor, an electronically operated water valve, and an electrical heating unit. This ice maker hooks up to the plumbing line in your house to provide fresh water for ice cubes. The water-fill valve supplies household water to the ice maker. When the water tray thermostat senses that the tray has reached the proper temperature, it signals the icemaker to start ejecting the ice cubes into the tray. The picture above shows the replacement ice maker for Whirlpool refrigerators - both the round or flat plug. The valve and bin are not included. The beauty of this Icemaker is that it replaces the following model icemakers (many of these are other brands .. not just Whirlpool and Maytag. Warmer days are upon us and although ice is a luxury and not a necessity .. go ahead and fix that icemaker. If you need to strip the wires, don't for to pick up a combination crimper. Take a look at this Combination Crimper, Wire Stripper and Bolt Cutter - the ultimate 3 in 1 tool for splicing wires. This useful tool is great for DIYourselfers and includes wire strippers for stripping off insulation from the wire. The crimpers are for crimping solderless connectors and the bolt cutters are for cutting small bolts. This is one of the highest quality tools of it's kind that we could find. "Green" Appliance Maintenance - Save the Earth and Money- CLICK HERE! Earth Day this year affected me more than usual. Little things can help preserve our earth for our children and grandchildren. I compiled a list of "appliance-related" items to help conserve energy and the earth. In the market for a new appliance? When you buy an appliance, you commit to paying both the first cost and the operating cost for as long as you own it. And over the life of an appliance, the energy cost to run it can be many times greater than the first cost. So it pays to buy an energy-efficient appliance. Instead of ammonia-based cleaners, use vinegar and water or baking soda and water for cleaning your appliances. Don’t use electric tools and appliances when hand-operated ones will do the job. Air-dry laundry when possible. Only use your dryer when needed. Avoid keeping refrigerator or freezer too cold. Government recommended temperature for fresh food is 38 degrees F. For freezers it’s 5 degrees F.
Install water-conserving showerheads and sink-faucet aerators. Insulate your water heater. Turn it down to 121 degrees F.
Thaw frozen foods in the refrigerator to reduce cooking times and to ensure food safety. Use small electric pans and ovens to reduce energy use. Believe it or not, when burner pans become blackened from heavy use, they can absorb a lot of heat, reducing burner efficiency. You want them to remain shiny so they reflect heat up to the cookware. Run your dishwasher only when full, and use the energy saver cycle. Don't hand-wash. Studies are showing more and more that, when used to maximize energy-saving features, modern dishwashers can outperform all but the most frugal hand washers. Keep lint screen in dryer clean . If you have any other tips - please post them in the comments. Let's keep helping each other out! 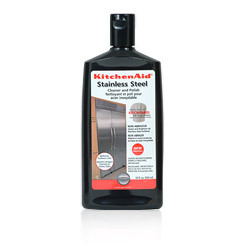 Kosher Certified Stainless Steel Cleaners- CLICK HERE! When it comes to cleaning stainless steel you will need to remember that stainless steel will scratch easily and when it does you’re either facing a power buffer or just living with it. So, never use steel wool or metal brushes to clean your stainless steel appliances. Fingerprints are one of the biggest complaints about stainless steel, but can be taken care by using glass cleaner or Stainless Steel Wipes like KitchenAid's. dishwashers, ranges, microwaves, grills, cookware, sinks and more. There are some newer types of finishes for stainless steel that resist fingerprints, a must if your pint-sized helpers leave their mark on your stainless steel appliances. KitchenAid Stainless Steel Appliance Cleaner and Polish is a kosher certified product that keeps stainless steel surfaces shining like new. Its powerful, no-shake formula works great on all appliances by removing food spills, grime, and stains. Stainless Steel Appliance Cleaner and Polish also works on grills and sinks.